HOLLYWOOD, California (CNN) — Singer Christina Aguilera joined fellow Grammy Award winners Alicia Keys and John Legend for “CNN Heroes: An All-Star Tribute,” which honored the top 10 CNN Heroes of 2008. The show, taped before an audience of more than 2,500 at the Kodak Theatre in Hollywood, premiered on the global networks of CNN on Thanksgiving night. It reairs on CNN/US and CNN en Espanol at 10 p.m. ET Friday and 8 p.m. ET Saturday and Sunday, and on CNN International at 5 a.m. and 12 p.m. ET Friday. Liz McCartney, dedicated to helping survivors of Hurricane Katrina rebuild their homes, was named 2008 CNN Hero of the Year. McCartney, who will receive $100,000 to continue her work just outside New Orleans, was selected from among the top 10 CNN Heroes after six weeks of online voting at CNN.com. More than 1 million votes were cast. Hosted by CNN’s Anderson Cooper, “CNN Heroes: An All-Star Tribute” featured musical performances by Aguilera, Keys and Legend. All three performances echoed the spirit of the CNN Heroes campaign, which salutes everyday people accomplishing extraordinary things in their communities and beyond. “In this time of economic turmoil, it is such a relief to know that there are people like these heroes, people who care more for others than they do for themselves,” Cooper said. The top 10 CNN Heroes, chosen by a blue-ribbon panel from an initial pool of more than 3,700 viewer nominations, were each honored with a documentary tribute and introduced by a celebrity presenter. Each of the top 10 Heroes receives $25,000. Actors Cameron Diaz, Salma Hayek, John Krasinski, Forest Whitaker, Meg Ryan, Terrence Howard, Lucy Liu, Jessica Biel, Kate Beckinsale and Selena Gomez were among the stars joining in CNN’s tribute to the top 10. In addition, actor Hugh Jackman presented People magazine’s 2008 Heroes Among Us award to six recipients honored by the magazine. Tad Agoglia, Houston, Texas: Agoglia’s First Response Team provides immediate help to areas hit by natural disasters. In a little more than a year, he and his crew have helped thousands of victims at more than 15 sites across the United States, free of charge. Yohannes Gebregeorgis, Addis Ababa, Ethiopia: Moved by the lack of children’s books and literacy in his native Ethiopia, Gebregeorgis established Ethiopia Reads, bringing free public libraries and literacy programs to thousands of Ethiopian children. Anne Mahlum, Philadelphia, Pennsylvania: On her daily morning jogs, Mahlum used to run past homeless men. Today, she’s helping to transform lives by running with them, and others as part of her Back On My Feet program. Phymean Noun, Toronto, Ontario: Growing up in Cambodia, Noun struggled to complete high school. Today, she offers hundreds of Cambodian children who work in Phnom Penh’s trash dump a way out through free schooling and job training. Viola Vaughn, Kaolack, Senegal: The Detroit, Michigan, native moved to Senegal to retire. Instead, a group of failing schoolchildren asked her to help them pass their classes. Today, her 10,000 Girls program is helping hundreds of girls succeed in school and run their own businesses. Two hundred and thirty-two years later, a reality that all men are created equal appears to have struck with the world’s super power electing its first black president. And for Africans, it is one exhilarating moment in time that represents hope and a belief that perhaps racism might finally be dying out in a world shamefully plagued by it over the years. But history has been made in the United States. Senator Barack Obama, born of a black Kenyan father and a white mother from Kansas, ascends to the most powerful office in the world, as the US President. For me - and of course the entire African continent - it’s a moment of great hope and exhilaration. Not, because I hail from Kenya, but because a member of the most burdened race on earth will now lead the most powerful State. Race is something that has been addressed widely during the 21 long months of campaign. The mere fact that a conservative country such as the United States has voted overwhelmingly for a black man, is a strong signal that race is fast diminishing as a barrier to achievement. And it’s not just the US. In the final weekend of the fierce race for the White House, many countries around the globe openly supported the Democrat, who they saw as the candidate who will offer hope. An opinion poll by Gallup showed that most countries in Africa, Europe and Asia overwhelmingly supported Obama. But notable cases are the “white dominated” countries like Britain where 60 per cent supported Obama to 15 per cent for McCain; Australia at 64 per cent to 14 per cent for McCain, Canada at 67 per cent to 22 per cent for McCain and Germany at 62 to 10 per cent for McCain. The fact that these countries openly and strongly supported a “man of colour,” they are sending a strong message that race is finally fading off in a world where cultures are faster fusing. 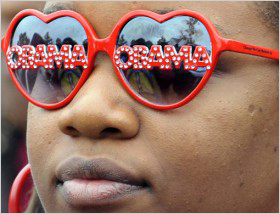 Obama’s election brings a new dimension to US foreign policy, particularly with regard to Africa. The African people are excited, not just because Obama is a black man, although that is certainly a thrill, but because he is inspirational, intelligent and qualified. He will bring real hope and development to the continent. It’s common sense that big words like unchecked capitalism, privatisation, globalisation and liberalisation have dealt a major blow to many businesses in Africa, but there is now broad bipartisan consensus in support of expanded trade relationships. Obama’s presidency will greatly facilitate the diplomacy required to try and make some progress on issues such as the humanitarian crisis in Congo, Darfur or the political situation in Zimbabwe. Having his roots in Africa, it gives him an edge in understanding the challenges facing developing countries. The Obama administration would also focus on helping Africans eliminate conflict across the continent. Let’s not forget the numerous major contributions of President George W. Bush’s administration to Africa. There has been much more continuity than discontinuity of the Bush administration’s Africa policies and initiatives than the previous Clinton administration’s policies and initiatives. In Bush’s term, the African Growth and Opportunities Act, which opened US markets to African goods on a massive scale, was passed. Due to this, jobs have been created across the continent. Aid has been increased through many programmes, including the President’s Emergency Plan for Aids Relief (PEPFAR). Away from Africa, Obama’s presidency sends a strong signal that US politics will change. He enters office with the expectation that he will restore order to the economy and bring renewal to the US and the whole world. Obama himself has promised to heal the world’s and America’s political divisions. There’s no doubt that these are weighty expectations that will require a superhuman effort. The continent expects so much more from Obama as it looks to him to finally turn decades of fine words about trade and debt-relief into reality for the African people. It’s a change we can believe in. Scientists in the remote Bale mountains of southern Ethiopia are in a race against time to save the world’s rarest wolf. Rabies passed from domestic dogs is threatening to kill up to two-thirds of all Ethiopian wolves. Scientists from the UK and Ethiopia are currently vaccinating wolf packs to prevent the spread of the disease. The population has dwindled to as few as 500, as a result of human encroachment into their habitat. Dr Claudio Sillero of Oxford University’s Wildlife Conservation Unit (WildCRU) says vaccinations are the only hope of maintaining the Ethiopian wolf population. “If left unchecked, rabies is likely to kill over two-thirds of all wolves in Bale’s Web Valley, and spread further, with wolves dying horrible deaths and numbers dwindling to perilously low levels,” he added. The plan is to vaccinate whole families or packs, typically a group with six adults. When these packs come into contact with unvaccinated wolves or dogs they will not catch the disease. The WildCRU team and the Ethiopian Wolf Conservation Authority say so far they have been very successful, catching and treating more than 40 wolves. The wolves are not injured in the trapping process, some even return to the traps once vaccinated in search of food. Dr Sillero says the wolves’ behaviour at this time of year makes them particularly vulnerable to catching diseases from other animals. The Bale mountains in southern Ethiopia form the most extensive high mountain plateau in Africa. 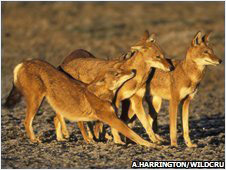 As well as being home to Ethiopian wolves, the plateau now also has an estimated population of 40,000 dogs. Brought in by shepherds to round up sheep, these dogs have become a reservoir for rabies. About 10,000 of these dogs are vaccinated against rabies every year but this has not prevented transmission. Outbreaks of the disease seem to occur in cycles. The researchers say they noticed the disease as far back as 1989 and previously ran a vaccination campaign in 2003. “It’s a powerful example of the importance of the science and practice of wildlife conservation combined in the effort to deliver practical solutions,” explains Professor David Macdonald, director of WildCRU. Dr Claudio Sillero sees the wolf’s survival as key to the continuation of the whole highland ecosystem. As a top carnivore, it is responsible for controlling the population of smaller grazing herbivores, especially rodents. “The wolves reign there; I like to think of them as the guardians of the high mountains of Africa,” he says. The vaccination campaign is due to continue until at least mid November.